We are expert negotiators armed with national Blue Book intelligence. Our team achieves the lowest price and fairest termed contracts on Core IT services for financial institutions, bar none. Provide just 1 invoice and less than 1 hour of time. There is NO REASON to switch Core & IT Service Providers in order to achieve major cost reduction, favorable business terms and a stronger relationship with your current vendors. Let Paladin prove it to you in less than 1 hour of your time! Find-out how much you areoverpaying. Can your contracts be made more bank-leaning to your needs? Discover the best time to renew. 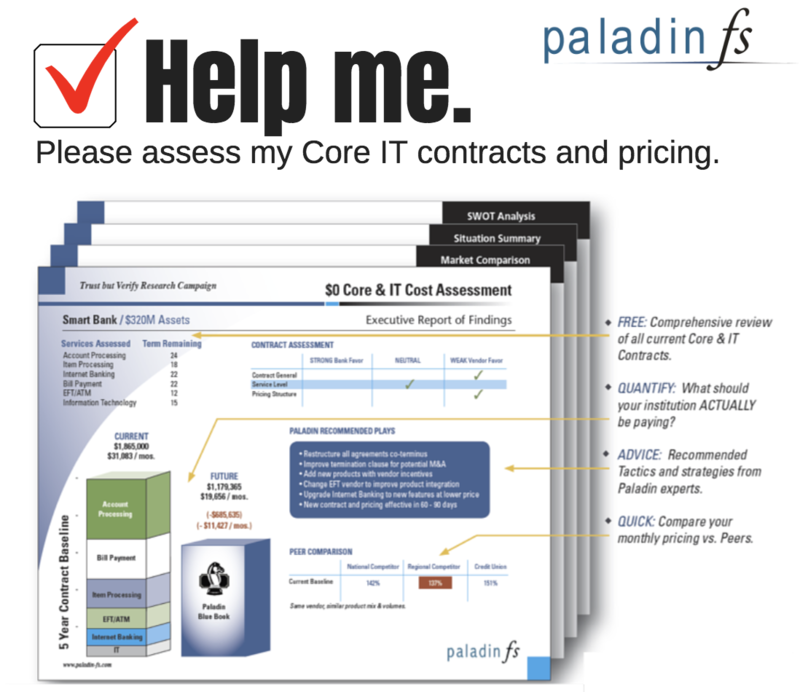 $1,380,000 is the average 5 year cost reduction (hard dollar) per institution that leveraged Paladin Decision Intelligence with out the need to change Core vendors.